The extra space under a staircase is one which is has been traditional used as storage. Too small to be used as a traditional living space, quite often it gets turned into the new home for your hoover, coats and shoes. However, as design is becoming more and more prevalent in people’s homes, they are starting to see new and creative ideas spring forward, in contradiction to the traditional. One of the issues with the under-stair space is that, due to the sloping ceiling, it is difficult to stand up, making its use as a living space limited. However instead of standing, why not lie down. 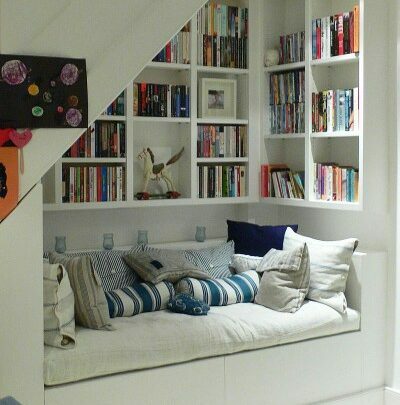 A seating area under the stairs, combined with a few pillows and maybe even a book shelf gives the perfect relaxation space with a peaceful afternoon reading being the goal. 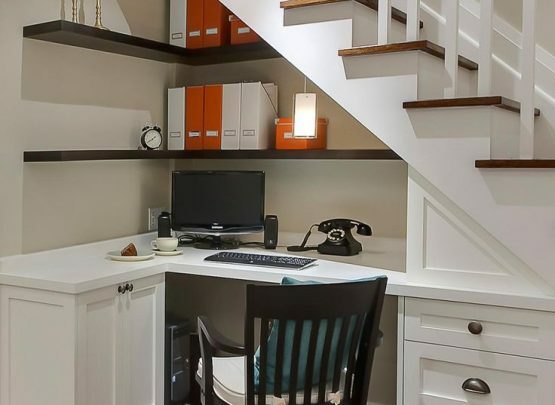 Another purpose for the under-stair space for living purposes and everyday use is as an office, or desk space. Using the under-stair section as a space for the desk, limits the footprint that it would have on the living area. The under-stair space also increases the amount of concentration, as you are facing into the under-stair section and away from the living area, you are focused on only what is under the staircase, which is this case is your desk and what is on it. A ever though we find it difficult to fit under the stairs, the same can not be said for our four legged friends. 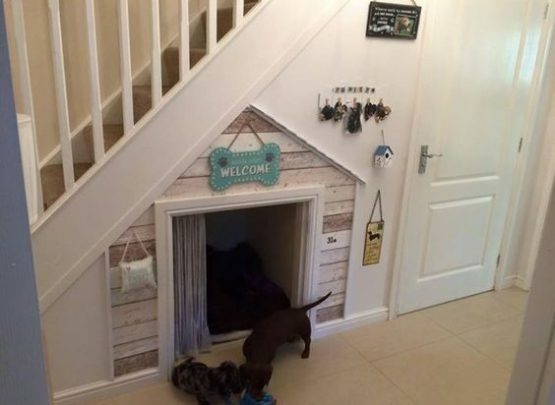 With some minor plaster work, a dog bed and a maybe a door or set of curtains you could have the perfect dog kennel. Lastly, even though under stair storage is boring, there are ways to make it more interesting. Tailor made storage solutions are becoming a big thing, especially when thinking about the underside of the stairs. Whether it be a set of draws, bookshelves or even a wine rack getting creative with the storage under the stairs will not only give you a place to store your things but even show them off.